If there’s one wardrobe item I really can’t live without in the spring/summer season, it’s my white jeans. I wear them at least three times per week, and I make sure to have two pairs (Rag & Bone and DL1961) that I love because one pair is inevitably always in the laundry. Not only do they go with literally everything, but I just love the fresh look of white denim in the spring. These three ladies look super chic in their white jeans – some look inspiration for this week! The third look is so chic + lovely! Totally agree- white jeans are my spring/summer staple! I so look forward to being able to wear them. I love all three pairings! I love white jeans! I agree with Liz, white jeans match well with pastel colors! Wait, which one is my favorite? I do really love the yellow blazer paired with a simple gray tee. Wow so gorgeous! I love the yellow look! I love all these outfits. The third especially! I would totally rock that. And the MiuMiu necklace??? AMAZING!!! Perfect looks for summer time! I love the third look, the length and cut of the denim are amazing! What great looks!! 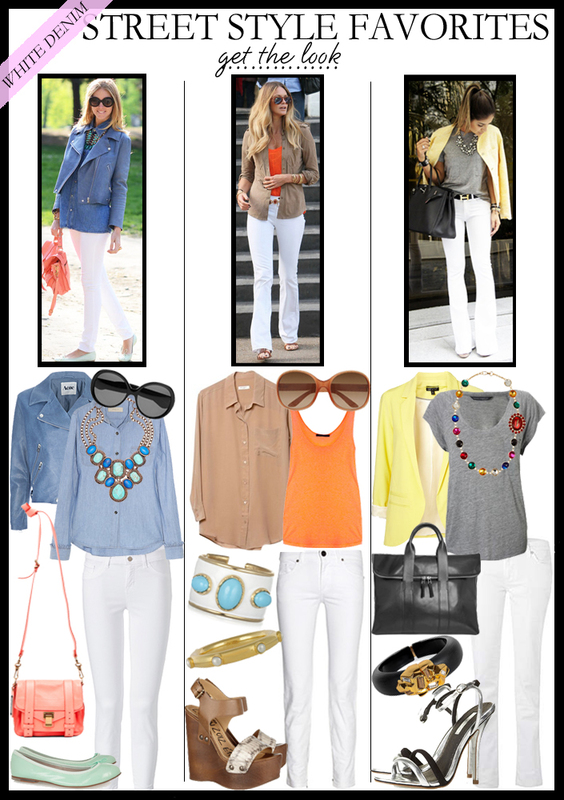 I love white jeans and these are perfect ways to style them to mix things up a bit. Love the white jean look! Very chic! I do love white denim…Outfit #3 is soooooo peferfect! I love the white denim with the chambray shirt. It's such a great summer look. One of my favorite things about the spring and summer is that I get to wear white denim! Is that sad?! DL1961 is one of my favorite lines of denim but I don't have any of their white jeans…I think I need to pick up a pair! Which style do you like? I love my Joes and Jcrew Matchstick white jeans. Love all these looks. Nothing better than white jeans with a chambray shirt. LOVE that 3rd look! Gotta have those TopShop sandals and Alexis Bittar cuff!